The scoreline might have gone a different direction had the referee awarded a penalty to Empoli after goalkeeper WojciechSzczesny fouled MameThiam. The loss means Empoli have failed to win any of their last seven matches – they actually have not even played a draw. The foul on Thiam is arguably a penalty kick but that could have changed the dynamic of the game. Juventus and Napoli are set to clash on Sunday night and the victory for Roma puts the spotlight on the results from that encounter. In another Serie A match, Lazio had a late goal to win 2-1 against Sassuolo. The result boosts their chances of making the spot for Champions League at the end of the season. 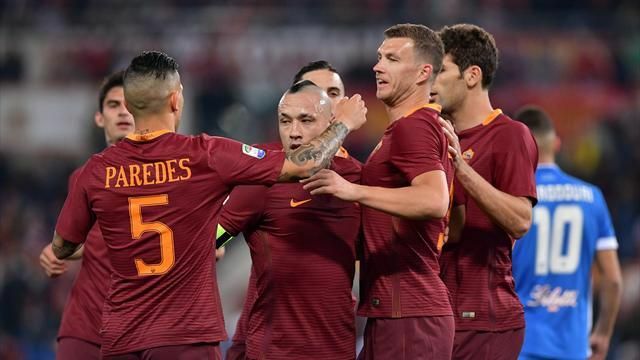 They would play Roma in the return leg of the Coppa Italia semifinal on Tuesday. Napoli remainin third place but Lazio close the gap to three points. Sassuolo went ahead first through DomenicoBerardiafter he was fouled in the box. He scored his first goal since August to give Sassuolo the hope of winning their first game since February. Lazio equalized courtesy of CiroImmobile. Lazio won the game six minutes from time as Cristiano Lombardi’s effort deflected off Francesco Acerbi.